For the money issue, a few fun ideas for your next business lunch. 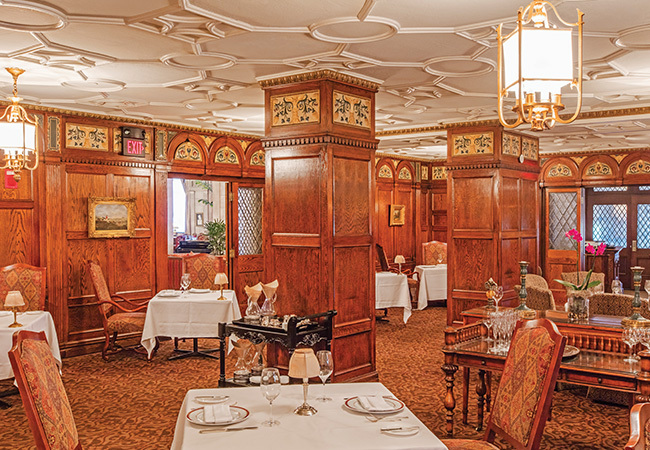 The fabled ritziness of The English Grill at The Brown Hotel is alive and well, though pretentiousness is nowhere to be found. Whether you’re pitching a high-power deal or are deep in negotiations, the unobtrusive staff won’t get in your way as you enjoy Chef de Cuisine Dustin Willett’s melding of traditional southern with his signature innovativeness. Owner Kevin Grangier is a stranger to minimalism. Think of the interior of Le Moo as a stage set for some souped-up wheeling and dealing. Go for the menu’s power player, a 32-ounce Tomahawk ribeye, if you’re out to make an impression. If subtlety better suits your style, blitz your palate with a repertoire of more modest steaks, as well as soups, salads, seafood and pasta. Kathy Cary and her restaurant, Lilly’s Bistro, are one of Louisville’s classiest duos. As the chef who first gave true local meaning to farm-totable, she’s keeping it exciting and ever-changing. The dining room is intimate for quiet biz buzz. Kathy, herself, is a savvy businessperson so you can be sure your experience will be seriously successful. Get down to business in the urban glitzy seafood haven Brendon’s Catch 22. The raw bar showcases a colossal seafood tower. Vegans, vegetarians and carnivores will all feel right at home as the menu is extensively varied. The three-martini lunch may be a thing of the past, but business diners may not want to forgo the restaurant’s craft cocktails and reserve wine list. 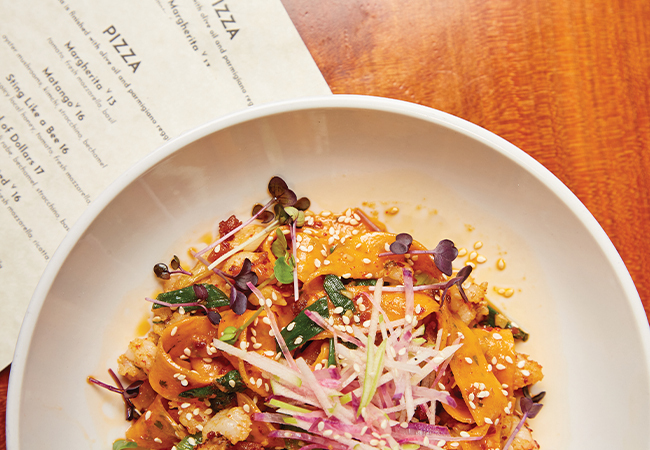 Pizza Lupo is so much more than pizza. Fermented Fresno chili tagliatelle with shrimp and Chef Max Balliet’s take on XO sauce is making him one of the city’s buzzed-about chefs. Dust is building up on the cookbooks on your shelf and the egos of television chefs are beginning to grate on your nerves. Yet, you want to be inspired and learn to cook as if you know what you’re doing. Let Cooking at Millie’s into your life. 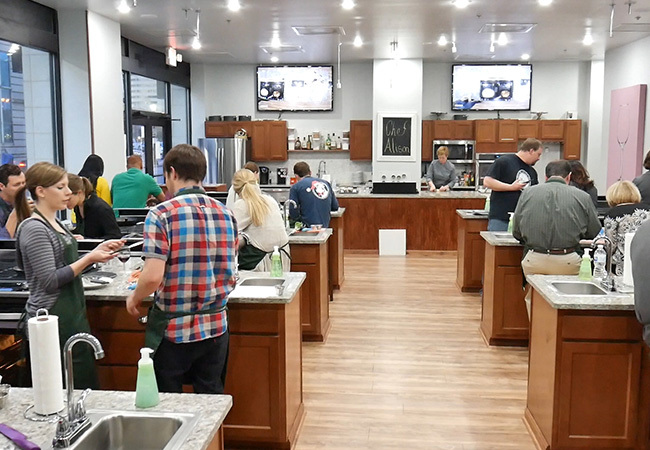 Resident Chef Allison Mann and guest chefs from some of Louisville’s top restaurants teach hands-on classes. You’ll learn to finesse three-course meals and will be able to eat what you cook during the class. And, there’s wine to liven up (or mellow) the learning process.